Back home in the sunny island of Jersey, in what newsrooms would usually call the 'silly season', an event takes place every year which epitomises the uniqueness and community spirit of life in the Channel Islands. 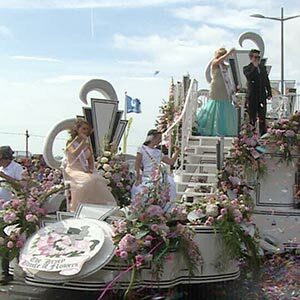 The Jersey Battle of Flowers is the island's annual carnival where on the second thursday of August, floats created by locals descend on St Helier's Victoria Avenue for the spectacle of islanders and tourists alike. The 2016 event saw over 15,000 spectators attend the parade, so after over 100 years there's no sign of 'Battle Fever' losing it's popularity. This enduring popularity leads regional broadcasters to pull out all the stops in order to produce the best possible Battle coverage. This year, the BBC's Channel Islands News team produced a special battle highlights programme broadcast during after it's usual nightly news-opt on BBC One. There was also live commentary across regional radio stations, and some great web coverage. I was working as a camera operator during the shoot, and thought the first TV Futures article of the academic year would be a good opportunity to look back at just some of what went into producing their TV coverage. Months of planning went into the ambitious multi-camera shoot which was vision mixed live on location. We needed to bring extra broadcast kit over from the UK on a ferry, which as anyone who lives in the Channel Islands will tell you can be an interesting experience. The boat due to bring the equipment and the programme's producer to the island was cancelled so some planning of camera positions was done through photos I'd gone out to take of the space to save some time when everyone and everything was ready to go. Extra cameras, talkback kit and a jib that was probably larger than the main CI News studio was just some of the equipment that had been brought over for the production. On the day of the parade, the team worked hard to assemble all the equipment into a makeshift studio setup at the side of the main grandstand with a gazebo serving as our "gallery", where the director would relay instructions to the camera operators. As the "roaming" camera, it was my job to try and offer up as many shots possible to be chosen before moving onto the next one. There was so much going on during the day, it provided so many opportunities for creative camera shots. This was also the first time I'd been tethered by SDI and comms cables to a mixing desk while walking around so this was a new experience for me. This was the first time I'd combined using the talkback system I'm used to using in a studio environment with the shoulder-mounted camera filming technique associated with working as a video journalist. It was brilliant to be involved with such a unique production. Previously I've taken it for granted how TV studios operate, as they're usually fixed installations; I'd never taken much notice of all the video, audio and data cabling required in a TV studio. It was only having to lay everything out during setup (and especially packing it all up again!) that I learned a lot more about the engineering involved with broadcasting. Having the opportunity to get involved with the BBC's coverage of the Jersey Battle of Flowers reaffirmed my love for television production. I'd love to return to Jersey when I graduate from university; because, I know it's a bit of clich© but, working in news is a brilliant example of how no two days at work are ever the same.